We are funders, educators, and advocates who want to seed hope and innovation at a time when undocumented communities are grappling with fear and uncertainty. We believe that increased collaborations across the state can help us uncover the best ideas and solutions to create positive change for diverse communities. Funders include Chavez Family Foundation, College Futures Foundation, Crankstart, ECMC Foundation, Grove Foundation, Evelyn & Walter Haas, Jr. Fund, Ginnie and Peter Haas, Jr. Fund, Heising-Simons Foundation, Hellman Foundation, The James Irvine Foundation, Kelson Foundation, Loud Hound Foundation, NextGen America, and Weingart Foundation. 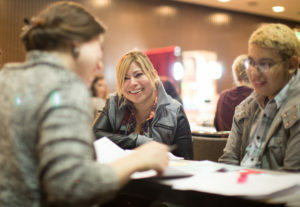 Immigrants Rising (formerly known as Educators for Fair Consideration), a fiscally-sponsored project of Community Initiatives, is administering the California Campus Catalyst Fund. Immigrants Rising will be overseeing the grant application and selection process; convening a core team of advocates, educators and funders to make grant decisions; and coordinating the delivery of technical assistance to grantees. Immigrants Rising has a proven commitment to promoting and facilitating opportunities for success for undocumented students. Since its inception,Immigrants Rising has partnered with higher education administrators and faculty, undocumented students, community-based organizations (including legal service providers), and immigration funders to expand support for immigrant youth and their families across California.